The mighty CIA has fallen victim to a major breach, with WikiLeaks revealing the true scope of the Agency’s ability for cyber-espionage. Its tools seem to be aimed at ordinary citizens – your phone, your car, your TV, even your fridge can become an instrument of surveillance in the hands of the CIA. How does the CIA use these tools, and why do they need them in the first place? And as WikiLeaks promises even more revelations, how is all of this going to shape the already tense relationship between new president and the intelligence community? A man who has spent over two decades in the CIA’s clandestine service – Gary Berntsen is on SophieCo. Sophie Shevardnadze: Gary Berntsen, former CIA official, welcome to the show, great to have you with us. Now, Vault 7, a major batch of CIA docs revealed by Wikileaks uncovers the agency’s cyber tools. We’re talking about world’s most powerful intelligence agency - how exactly did the CIA lose control of its arsenal of hacking weapons? Gary Berntsen: First off, I’d like to say that the world has changed a lot in the last several decades, and people are communicating in many different ways and intelligence services, whether they be American or Russian, are covering these communications and their coverage of those communications has evolved. Without commenting on the specific validity of those tools, it was clear that the CIA was surely using contractors to be involved in this process, not just staff officers, and that individuals decided that they had problems with U.S. policy, and have leaked these things to Wikileaks. This is a large problem, for the U.S. community, but just as the U.S. is having problems, the Russia face similar problems. Just this week you had multiple members of the FSB charged with hacking as well, and they have been charged by the U.S. government. So both services who are competitors, face challenges as we’ve entered a new era of mass communications. SS: So like you’re saying, the leaker or leakers of the CIA docs is presumably a CIA contractor - should the agency be spending more effort on vetting its own officers? Is the process rigorous enough? GB: Clearly. Look… There have been individuals since the dawn of history. Espionage is the second oldest occupation, have conducted spying and espionage operations, and there have been people who have turned against their own side and worked for competitors and worked for those opposing the country or the group that they’re working with. It’s been a problem from the beginning, and it continues to be a problem, and the U.S. clearly is going to have to do a much better job at vetting those individuals who are given security clearances, without a doubt. SS: The CIA studied the flaws in the software of devices like iPhones, Androids, Smart TVs, apps like Whatsapp that left them exposed to hacking, but didn’t care about patching those up - so, in essence the agency chose to leave Americans vulnerable to cyberattacks, rather than protect them? GB: I think you have to understand, in this world that we’re operating and the number one target of our intelligence community are terrorists. Since the attacks of 9\11, 16 years ago, the obsession of the American intelligence community is to identify those planning terrorist attacks, collecting information on them and being able to defeat them. These individuals are using all these means of communication. I have spoken with many security services around the world, since my retirement back in 2005-2006, a lot of them have had problems covering the communications of somebody’s very devices and programs that you’ve talked about - whether they be narcotraffickers or salafist jihadists, they are all piggybacking off of commercial communications. Therefore the need for modern intelligence services to sort of provide coverage of all means of communications. And there’s a price that you pay for that. SS: One of the most disturbing parts of the leaks is the “Weeping Angel” program - CIA hacking into Samsung Smart TVs to record what’s going on even when the TV appears to be turned off. Why are the CIA’s tools designed to penetrate devices used by ordinary Western citizens at home? GB: Look, I wouldn’t say it has anything to do with Western homes, because the CIA doesn’t do technical operations against American citizens - that’s prohibited by the law. If the CIA does anything in the U.S., it does it side-by-side with the FBI, and it does it according to FISA - the Foreign Intelligence and Surveillance Act laws. It’s gotta go to the judge to do those things. Those tools are used primarily against the individuals and terrorists that are targeting the U.S. or other foreign entities that we see as a significant threat to the U.S. national security, which is the normal functioning of any intelligence service. SS: Just like you say, the CIA insists it never uses its investigative tools on American citizens in the US, but, we’re wondering, exactly how many terrorist camps in the Middle East have Samsung Smart TVs to watch their favorite shows on? Does it seem like the CIA lost its direction? GB: I’ve travelled in the Middle East, Samsungs are sold everywhere. Sophie, Samsung TVs are sold all over the world. I’ve spent a lot of time in the Middle East, I’ve seen them in Afghanistan, I’ve seen them everywhere. So, any kind of devices that you can imagine, people are using everywhere. We’re in a global economy now. SS: The CIA has tools to hack iPhones - but they make up only around 15 % of the world’s smartphone market. IPhones are not popular among terrorists, but they are among business and political elites - so are they the real target here? GB: No. The CIA in relative terms to the size of the world is a small organisation. It is an organisation that has roughly 20 or more thousand people - it’s not that large in terms of covering a planet with 7 billion people. We have significant threats to the U.S. and to the Western world. We live in an age of super-terrorism, we live in an age when individuals, small groups of people, can leverage technology at a lethal effect. The greatest threats to this planet are not just nuclear, they are bio. The U.S. needs to have as many tools as possible to defend itself against these threats, as does Russia want to have similar types of tools to defend itself. You too, Russian people have suffered from a number of terrible terrorist acts. SS: Wikileaks suggest the CIA copied the hacking habits of other nations to create a fake electronic trace - why would the CIA need that? GB: The CIA, as any intelligence service, would look to conduct coverage in the most unobtrusive fashion as possible. It is going to do its operations so that they can collect and collect again and again against terrorist organisations, where and whenever it can, because sometimes threats are not just static, they are continuous. SS: You know this better, so enlighten me: does the he CIA have the authorisation to create the surveillance tools it had in the first place? Who gives it such authorisation? GB: The CIA was created in 1947 by the National Security Act of the U.S. and does two different things - it does FI (foreign intelligence) collection and it does CA - covert action. Its rules for collection of intelligence were enshrined in the law that created it, the CIA Act 110, in 1949, but the covert action part of this, where it does active measures, when it gets involved in things - all of those are covered by law. The Presidential finding had to be written, it had to be presented to the President. The President's signs off on those things. Those things are then briefed to members of Congress, or the House Permanent Subcommittee for Intelligence and the Senate Select Committee for Intelligence. We have a very rigorous process of review of the activities of our intelligence communities in the U.S.
GB: Those tools and the creation of collection tools falls under the same laws that allowed the CIA to be established. And that was the 1949 Intelligence Act. And also, subsequently, the laws in 1975. Yes. GB: There’s absolutely no point to that, and it’s random. GB: I’m sure they are computer-generated. SS: Trump accused Obama of wiretapping him during the campaign… Could the CIA have actually spied on the president? It seems like the agency doesn’t have the best relationship with Donald Trump - how far can they go? GB: Let me just say this: the President used the word “wiretapping” but I think it was very clear to us that have been in the intelligence business, that this was a synonym for “surveillance”. Because most people are on cellphones, people aren’t using landlines anymore, so there’s no “wiretapping”, okay. These all fall under the Intelligence Surveillance Act, as I stated earlier, this thing existing in the U.S.. It was clear to President Trump and to those in his campaign, after they were elected, and they did a review back that the Obama Administration sought FISA authorisation to do surveillance of the Trump campaign in July and then in October. They were denied in July, they were given approval in October, and in October they did some types of surveillance of the Trump campaign. This is why the President, of course, tweeted, that he had been “wiretapped” - of course “wiretapping” being a synonym for the surveillance against his campaign, which was never heard of in the U.S. political history that I can remember, I can’t recall any way of this being done. It’s an outrage, and at the same time, Congressional hearings are going to be held and they are going to review all of these things, and they are going to find out exactly what happened and what was done. It’s unclear right now, but all we do know - and it has been broken in the media that there were two efforts, and at the second one, the authorisation was given. That would never have been done by the CIA, because they don’t do that sort of coverage in the U.S.. That would either be the FBI or the NSA, with legal authorities and those authorities… the problem that the Trump administration had is they believed that the information from these things was distributed incorrectly. Any time an American - and this is according to the U.S. law - any time an American is on the wire in the U.S., their names got to be minimized from this and it clearly wasn’t done and the Trump administration was put in a bad light because of this. SS: If what you’re saying is true, how does that fall under foreign intelligence? Is that more of the FBI-NSA expertise? GB: It was FBI and NSA - it was clearly the FBI and the NSA that were involved, it would never have been the CIA doing that, they don’t listen to telephones in the U.S., they read the product of other agencies that would provide those things, but clearly, there were individuals on those phone calls that they believed were foreign and were targeting those with potential communications with the Trump campaign. Let’s be clear here - General Clapper, the DNI for President Obama, stated before he left office, that there was no, I repeat, no evidence of collusion between the Trump campaign and Russia. This has been something that has been dragged out again, and again, and again, by the media. This is a continuing drumbeat of the mainstream, left-wing media of the U.S., topaint the President in the poorest light, to attempt to discredit Donald Trump. SS: With the intelligence agencies bringing down Trump’s advisors like Michael Flynn - and you said the people behind that were Obama’s loyalists - can we talk about the intelligence agencies being too independent from the White House, playing their own politics? GB: I think part of the problem that we’ve seen during the handover of power from President Obama to President Trump was that there was a number of holdovers that went from political appointee to career status that had been placed in the NatSec apparatus and certain parts of the intelligence organisations. It is clear that President Trump and his team are determined to remove those people to make sure that there’s a continuity of purpose and people aren’t leaking information that would put the Administration into a negative light. That’s the goal of the administration, to conduct itself consistent with the goals of securing the country from terrorism and other potential threats - whether they be counter-narcotics, or intelligence agencies trying to breach our… you know, the information that we hold secure. SS: Here’s a bit of conspiracy theories - could it be that the domestic surveillance agencies like the NSA or the FBI orchestrated the Vault 7 leaks - to damage CIA, stop it from infringing on their turf? GB :I really don’t think so and that is conspiracy thinking. You have to understand something, in the intelligence communities in the U.S., whether it be the CIA and FBI, we’ve done a lot of cross-fertilizations. When I was in senior position in CIA’s counterterrorism center, I had a deputy who was an FBI officer. An office in FBI HQ down in Washington had an FBI lead with a CIA deputy. There’s a lot more cooperation than one would think. There are individuals that do assignments in each other’s organisations to help foster levels of cooperation. I had members of NSA in my staff when I was at CIA, members of diplomatic security, members of Alcohol, Tobacco and Firearms, and it was run like a task force, so, there’s a lot more cooperation than the media presents, they always think that there are these huge major battles between the organisations and that’s rarely true. SS: Generally speaking - is there rivalry between American intel agencies at all? Competition for resources, maybe? GB: I think, sometimes, between the Bureau and the CIA - the CIA is the dominant agency abroad, and the FBI is the dominant agency in the U.S. What they do abroad, they frequently have to get cleared by us, what we do domestically, we have to get cleared by them, and sometimes there’s some friction, but usually, we’re able to work this out. It makes for great news, the CIA fighting FBI, but the reality is that there’s a lot more cooperation than confrontation. We are all in the business of trying to secure the American homeland and American interests globally. SS: I’m still thinking a lot about the whole point of having this hacking arsenal for the CIA since you talk on their behalf - the possibility to hack phones, computers, TVs and cars - if the actual terrorist attacks on US soil, like San Bernardino, Orlando are still missed? GB: Look. There are hundreds of individuals, if not thousands, planning efforts against the U.S. at any time. It can be many-many things. And the U.S. security services, there’s the CIA, the FBI, NSA - block many-many of these things, but it is impossible to stop them all. Remember, this is an open society here, in America, with 320 million people, here. We try to foster open economic system, we allow more immigration to America than all countries in the world combined. This is a great political experiment here, but it’s also very difficult to police. There are times that the U.S. security services are going to fail. It’s inevitable. We just have to try the best we can, do the best job that we can, while protecting the values that attract so many people to the U.S.
SS:The former CIA director John Brennan is saying Trump’s order to temporarily ban travel from some Muslim states is not going to help fight terrorism in ‘any significant way’. And the countries where the terrorists have previously come from - like Saudi Arabia, or Afghanistan, it’s true - aren’t on the list. So does he maybe have a point? GB: John Brennan is acting more like a political operative than a former director of CIA. The countries that Mr. Trump had banned initially, or at least had put a partial, sort of a delay - where states like Somalia, Libya, the Sudan, Iran - places where we couldn’t trust local vetting. Remember something, when someone immigrates to the U.S., we have what’s called an “immigration packet”: they may have to get a chest X-ray to make sure they don’t bring any diseases with them, they have to have background check on any place they’ve ever lived, and in most of these places there are no security forces to do background checks on people that came from Damascus, because parts of Damascus are totally destroyed - there’s been warfare. It is actually a very reasonable thing for President Trump to ask for delay in these areas. Look, the Crown-Prince, the Deputy Crown-Prince of Saudi Arabia was just in the United States and met with Donald Trump, and he said he didn’t believe it was a “ban on Muslims”. This was not a “ban on Muslims”, it was an effort to slow down and to create more opportunity to vet those individuals coming from states where there’s a preponderance of terrorist organisations operating. A reasonable step by President Trump, something he promised during the campaign, something he’s fulfilling. But again, I repeat - America allows more immigration into the U.S., than all countries combined. So, we really don’t need to be lectured on who we let in and who we don’t let in. GB: Wait a second, Sophie - the Saudis have a reasonable form to police their society, and they provide accurate police checks. If they didn’t create accurate police checks, we would’ve given the delay to them as well. SS: Ok, I got your point. Now, Michael Hayden, ex-CIA and NSA chief, pointed out that the US intelligence enlists agents in the Muslim world with the promise of eventual emigration to America - is Trump’s travel ban order going to hurt American intelligence gathering efforts in the Middle East? GB: No, the question here - there were individuals that worked as translators for us in Afghanistan and Iraq and serving in such roles as translators, they were promised the ability to immigrate to the United States. Unfortunately, some of them were blocked in the first ban that was put down, because individuals who wrote that, didn’t consider that. That has been considered in the re-write, that the Trump administration had submitted, which is now being attacked by a judge in Hawaii, and so it was taken into consideration, but… the objective here was to help those that helped U.S. forces on the ground, especially those who were translators, in ground combat operations, where they risked their lives alongside American soldiers. SS:You worked in Afghanistan - you were close to capturing Bin Laden back in 2001 - what kind of spying tools are actually used on the ground by the CIA to catch terrorists? GB: The CIA as does any intelligence service in the world, is a human business. It’s a business where we work with local security forces to strengthen their police and intelligence forces, we attempt to leverage them, we have our own people on the ground that speak the language, we’re trying to help build transportation there. There’s no “secret sauce” here. There’s no super-technology that changes the country’s ability to conduct intelligence collections or operations. In Afghanistan the greatest thing that the U.S. has is broad support and assistance to Afghan men and women across the country. We liberated half of the population, and for women were providing education, and when the people see what we were doing: trying to build schools, providing USAID projects - all of these things - this makes the population willing to work with and support the United States. Frequently, members of the insurgence groups will see this and sometimes they do actually cross the lines and cooperate with us. So, it’s a full range of American political power, whether it’s hard or soft, that is the strength of the American intelligence services - because people in the world actually believe - and correctly so - that American more than generally a force of good in the world. SS: Gary, thank you so much for this interesting interview and insight into the world of the CIA. 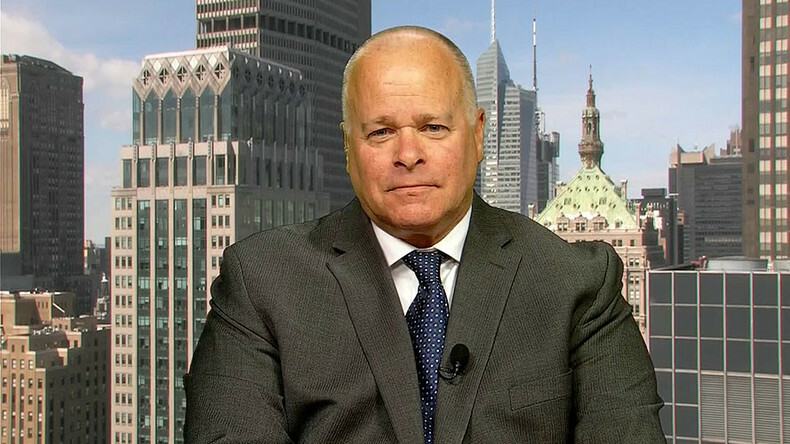 We’ve been talking to Gary Berntsen, former top CIA officer, veteran of the agency, talking about the politics of American intelligence in the Trump era. That’s it for this edition of SophieCo, I will see you next time.